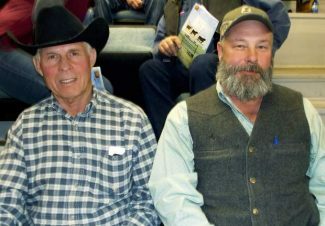 Bill and Will Parks of Weston, Wyo. 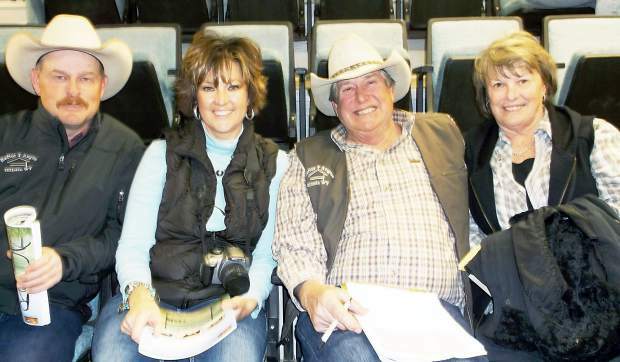 Scott and Jodean Crockett of Recluse, Wyo., seated with Kale and Kim Kretschman of Rafter T Angus. 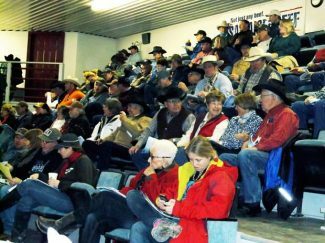 Location: Buffalo Livestock Auction Buffalo, Wyo. Bull 3251, PRA Game Day 3251, sold to the Paint Rock Ranch for $9,500. This GDAR Game Day 449 son has EPDs of BW -0.6, WW 46, YW 88, and Milk 26 complimented with actual birth and 205 weights of 78 pounds and 735 pounds. Bull 3139 sold for a close second of $9,000 to Bradley DeVries of Platte, S.D. PRA Onward 3139 is a Sitz Onward 496R son with actual birth and 205 weights of 84 pounds and 840 pounds. His EPDs are BW 1.5, WW 53, YW 92, and Milk 26. Bull 323, also purchased by Bradley DeVries, sold for $8,500. PRA Windy 323 is a son of Apex Windy 078 posting EPDs of BW 3.2, WW 65, YW 105, and Milk 35. This bull had actual birth and 205 weights at 86 pounds and 755 pounds. Bull 3114, PRA Kodiak 3114, also sold for $8,500 to Balleck Livestock of Buffalo, Wyo. This Soo Line Kodiak 1049 son has EPDs of BW 3.6, WW 52, YW 90, and Milk 22 while his actual birth and 205 weights were 88 pounds and 783 pounds. Bull 3176, PRA Game Day 3176, sold for $8,000 also to Balleck Livestock. This GDAR Game Day 449 son had actual birth and 205 weights of 74 pounds and 736 pounds complimenting EPDs of BW -1.2, WW 48, YW 84, and Milk 28. Bull 3230 also sold for $8,000 to Crockett Cattle Co. of Recluse, Wyo. PRA Bandwagon 3230 is a LT Bandwagon 3105 son who posted EPDs of BW 1.3, WW 45, YW 77, and Milk 36 while his actual birth and 205 weights were 78 pounds and 714 pounds.